CHENNAI.APRIL.11. Dr.S.P.Koppikar's Foundation for Homoeopathy has celebrated World Homoeopathic Day, Father of Homoeopathy Dr. Samuel Hahnemann's Birthday and Dr.S.P.Koppikar's Birthday at The Life auditorium, Loyola college, Chennai. 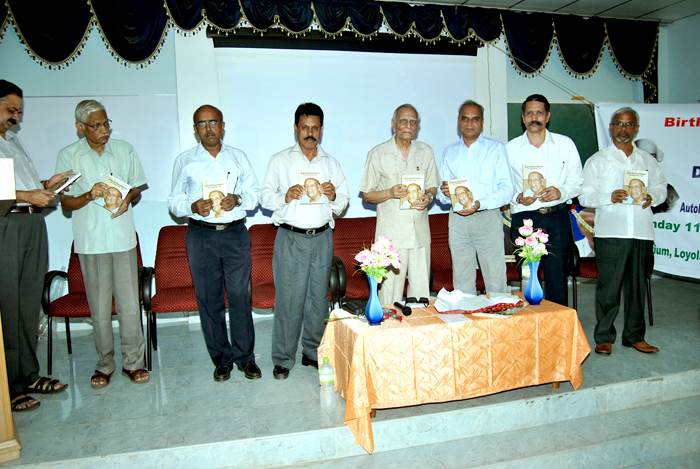 Dr.Jayesh V.Sanghvi welcomed the gathering Shri.R.R.Bagri released the Tamil version of Dr.S.P.Koppikar's autobiography and Dr.A.Thamarai Selvan recieved it. Dr.Eswara Das, Director National Institute of Homoeopathy, Kolkatta, paid floral tribute to Dr. Samuel Hahnemann. A scientific session was contributed by the speakers Dr.B.Krishnaswamy, Professor and Head of the Department of Geriatrics, Madras Medical College and Dr.P.V.Venkatraman, on Geriatric ailments. The program was co ordinated by Dr.G.Suresh and Dr.S.Alwin Babu. and Dr.S.Mohammed Aleem proposed vote of thanks.